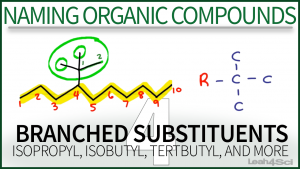 This tutorial video shows you how to name organic compounds with substituents coming off their substituents. This includes the ‘long’ version of naming each individual group, and the accepted abbreviations like tert-butyl and isopropyl. This is Video 4 in the Naming Organic Compounds Video Series. Click HERE for the entire series. This video helped clarify my questions on the structures. Thank you! Regarding 4-(1-methylethyl)-octane couldn’t you drop the 1 as that’s the only place the methyl group can go? If in doubt is it always best to add a number? What do you use as reference? I went to IUPAC website but didn’t find it very useful. I like your videos. To the point. Much more interesting and understandable than a 4 roomed packed class. Thank u for this video, I was having a trouble in understanding this topic. Well now I am surely getting 6 marks in my finals..
It’s not 4-(ethyl-1-methyl) because of the alphabetical rule? Thank you for being awesome! Seriously saving my life and making this process towards medical school a little more smoothly. So very very grateful to have run cross you on youtube! Thank you Monica! glad I can help. Are you in orgo right now? Thank you, what are you studying right now? Thank you sooooo much It is amazing . Awesome! this video helped me a lot! to understand iso and sec and tert! which was like greek and latin to me before..
oh! and i too have a friend named leah! Thank you, I’m so glad I can help you make sense of this complex topic. awesome!!!! thanks 4 helping i was having a lot of trouble regarding this! !